In our judgment, the best, the most striking of white-variegated upright Japanese Maples. A big plus: almost no reversion to green but you receive them from us they will grow vigorously and it is fairly standard for them to be all green. 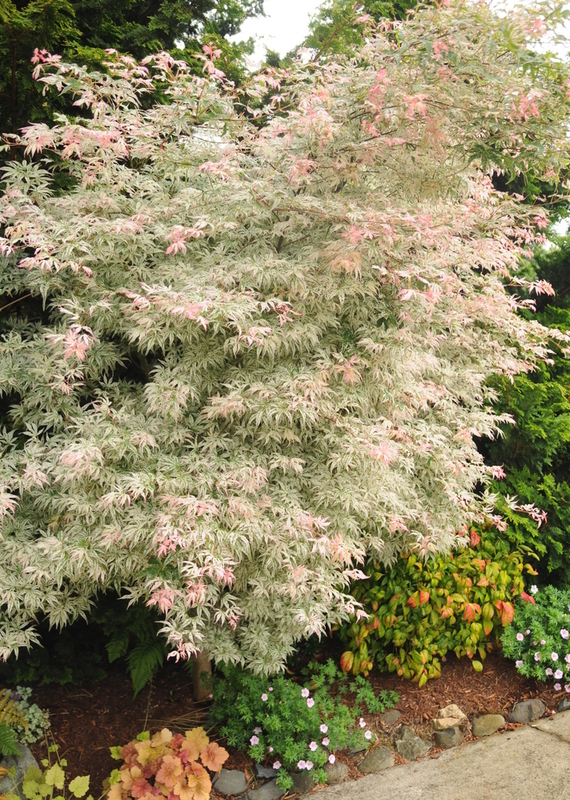 In the years to come, when they settle down into slower growth and they will display the standard white and pink variegation.Though it is not a good choice for the deep South where the heat seems to keep the variegation permanently away. From a distance, the small green, white and pink variegated leaves have an ethereal effect. This conversation item is just perfect to showcase a shady spot in the garden, eventually reaching 16 ft. tall. No surprise here; its a Great Plant Picks selection.